The all-new Eva 6.5 is our ‘go-to’ bike for trail riding. All Eva models have new women-specific frames with women tailored sizing. The 27.5" wheel size rolls faster and easier over obstacles on the trail than the 26” wheels, and offers a more optimized fit than a typical 29er. The fit of the bikes inspires confidence with uncompromising trail agility. A woman designer created the Eva graphics, and colors were selected with help from our female feedback panel. Today, the Eva Line represents a new level of women’s critique, influence, and enthusiasm for the Raleigh brand. Many of the Eva components are women-specific. This includes saddles, grips with small diameters to better fit women’s hands and handle bar widths and stem lengths that have been individually selected for every frame size to ensure optimal fit and handling. All of these things combine to make a complete, trail-ready package for women riders. All Eva 27.5 models have new women-specific frames with women- tailored sizing. Lightweight yet strong, they offer an optimized fit for a confident, fun and rewarding ride. We asked a panel of female riders which touch-point components they liked best to ensure the best possible experience out on the trail. The Eva saddles are women-specific and our handle bar widths and stem lengths have been individually selected for every frame size to ensure optimal fit and handling.The grips have a slightly smaller diameter to accommodate smaller hands, and our Eva 7.5 and 6.5 models feature a slim-diameter ergonomic grip to increase comfort even further. The new women-specific geometry was created using the Raleigh Sizing System. Our sizing system for Eva is based on a database of all female bike fittings and our new sizing decal can be used as a guideline to determine the correct bike size. 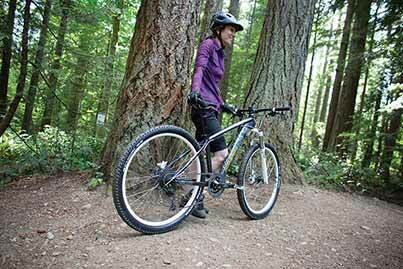 A great fitting bike delivers optimal handling and allows you to go out on the trail with confidence. Having fun in the dirt starts with an Eva 27.5. We started with a wide 28mm rim that spreads out and increases the tire's contact patch, offering better traction. Going one step further, we used a bigger tire with an aggressive tread pattern. Combined, these elements deliver a more comfortable ride with greater traction, offering new riders the confidence of control while navigating single track. We asked a panel of female riders which touch-point components they liked best and which aesthetics they preferred to ensure the best possible experience out on the trail.The Eva saddles are women-specific and our handle bar widths and stem lengths have been individually selected for every frame size to ensure optimal fit and handling.The grips have a slightly smaller diameter to accommodate smaller hands, and our Eva 7.5 and 6.5 models feature a slim-diameter ergonomic grip to increase comfort even further. The graphics and colors for the Evas were created by a woman and selected by our female feedback panel. Today, the Evas represent a new level of women's feedback, influence, and enthusiasm for the Raleigh brand. We're proud to say our women's line is the best it's ever been. And it's never looked this good. The all-new women-specific Eva 27.5 collection would be Goldilocks' pick for trail riding. This just-right size rolls faster and easier than the 26 over obstacles in the trail, and offers a fit for her that the 29er simply can't. In other words, confidence-inspiring fit with uncompromising trail agility. Proper Mountain Bike fit is largely driven by stack height. Having the handle bar at the correct height ensures maximum control and greatest comfort. Based on our database of bike fittings the stack height of a 27.5" wheel offers the best fit for a very large percentage of women. More than 90% of women in the United States are between 5'0" and 6'0". Based on this we determined that 27.5" wheels are the best fit for the vast majority of female riders in the U.S. We strongly believe in the benefits of the larger 29er wheel, but we see proper fit as crucial to having fun and being in control on the trail.